Get your Italian meat fix! Take a photo tour of Alle-Pia in Atascadero. Charlie can keep his Everlasting Gobstoppers and Wonka Bars. The real golden ticket isn’t hiding beneath the wrapper of some fantastical candy bar—it’s actually nestled under the powdery casing of a handmade truffle salami cured with wine, aromatic herbs, and earthy spices. PORK PLATE: Chef/Owner of Buona Tavola restaurants and Alle-Pia Fine Cured Meats Antonio Varia spices up fragrant, earthy truffle salumi cured at his Atascadero Emporio and processing facility. Behind the wondrous doors of Atascadero’s Alle-Pia Emporio exists a factory for the meat obsessed. It is a charcuterie lover’s paradise, filled with the scent of sundried-tomato pork sausage, pancetta, and fresh cracked black pepper. It is a magical place where hundreds of handmade salami air dry by string, the finest grass-fed cured pork is transformed into glistening ribbons of fleshy prosciutto, and mythical Italian cheeses like creamy sheep’s milk Percorino di Rocca from Tuscany and hard, slow-ripened Grana Padano from Piacenza province sit behind a heavenly to-go case. Where else can you find real Italian pasta—the kind with enough heft and texture to pick up big gobs of sauce? Where else can you come face to face with a hunk of cured pork jowl (Italian translation: guanciale), freshly sliced and layered between sheets of delicate parchment paper? I was lucky enough to down two slices of salty-fatty pork jowl (and more than a few slices of addicting truffle salami), and I must admit that I’m still dreaming about the salty, savory flavors dancing on my tongue. This, my friends, is the difference love makes. All of Alle-Pia’s pork products are made with premium, never-frozen natural Hampshire hogs shipped from Iowa. Next comes a hefty dose of spices from Spice of Life in Paso Robles, some Italian or local wine (the spicy sopressa calls for a bottle of Santa Margarita-based Ancient Peaks) and a whole lot of aging. Alle-Pia Owner Antonio Varia is committed to making his ma, Maria Pia Allesina, proud. The chef and owner of Buona Tavola restaurants lovingly named his salumi company after her. His handcrafted touch pays homage to the family’s tradition of making salami together each winter. It was a boisterous, hands-on task that got everyone laughing under one roof. 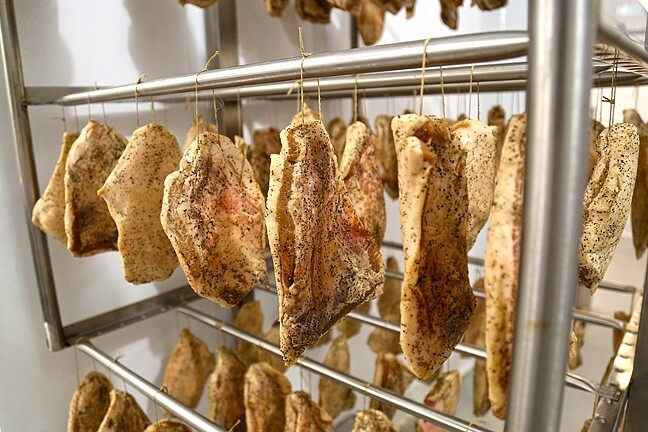 HANG ON: Dozens of handmade guanciale (cured pork jowl) age to a graceful flavor. Varia may have relocated from his home of Piedmont, Italy, to the Central Coast many years ago, but that tradition lives on. Needless to say, people fell head over heels for the authentic Italian flavor. Today, Varia works with his nephew and fellow Piedmont native, Alex Pellini, to create the traditional meats. Alex was living in England when his uncle started up the salami tradition, and he wanted to help out with his uncle’s popular restaurants. In 2009, he made the leap, and now lives in San Miguel with his budding family, not far from Varia’s Creston farm. 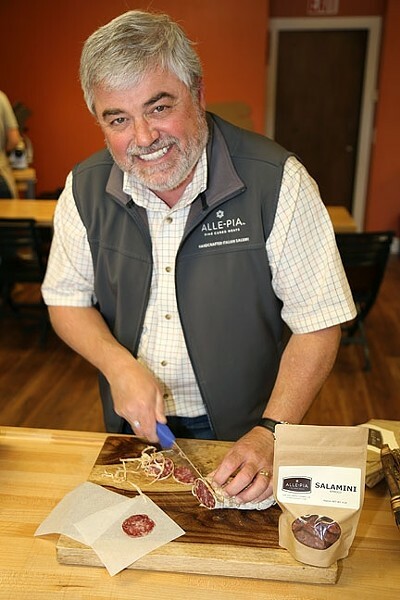 MADE WITH LOVE: Alex Pellini of Alle-Pia Fine Cured Meats spends his days mixing spices, aging pork, and ensuring quality control at his uncle’s Atascadero cured meats processing facility and Emporio. Stop by the Emporio and you’ll likely run into Varia working on restaurant orders at a small desk behind the counter. He said folks from Los Angeles and San Francisco are known to stop by and ask for tours of the production facility, which he happily grants. As I soon found, there’s still a lot of laughter to go around in that production facility: Pellini even donned a salami “necklace” during one point of the tour. On the day of my visit, Pellini was busy helping his uncle trim meats that would one day bathe in garlic-infused wine. The next day, he’d start on stuffing and tying off salamis, each on a one-month aging program. Depending on the size, a single salami might spend two months awaiting perfection. The processing facility—a clean, white laboratory punctuated by shelves and hanging coolers of red meaty goodness—is located behind Alle-Pia’s new Emporio storefront, which faces El Camino Real. Varia said he created the grab-and-go Emporio because he saw a lack of his favorite foods in local markets. Here, you can find French and Italian cheeses, Italian pasta and rice and—of course—the meats Varia’s family loves so dearly. I mean, c’mon. The guys recently released bags of snackable sized salami chunks for optimum ease of enjoyment. Who needs chips when you have the meats? Until now, fans of Alle-Pia have had three choices: stop at the Templeton Farmers’ Market, buy from the online store, or search out the meats from select retailers. Restaurants in the know have used the flavorful meats for years, and, of course, you can find the cured delicacies at both of Varia’s Paso Robles and San Luis Obispo Buona Tavola restaurants. Now, things have become a bit more convenient, and if you ask this card-carrying meat lover, it’s about time. SALTY! 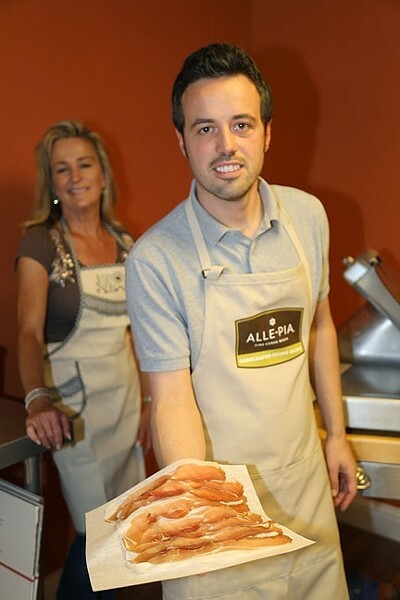 : Alle-Pia Fine Cured Meats and Emporio is located at 8390 El Camino Real and is open Monday through Friday from 9 a.m. to 3 p.m. For more information, go to allepiasalumi.com, email info@allepiasalumi.com or call 461-6800. “Alex and I are the biggest customers because we take so much of the product home ourselves,” Varia said with a big laugh. “We take some prosciutto, some mortadella, some burrata—it’s great.” He added that fellow Alle-Pia team member Cece Chambless is known to make a mean speck and Gorgonzola sandwich. The possibilities are endless. If fact, the first piece of food Pellini’s daughter—Varia’s niece—put in her mouth was a slice of handmade salami. It was her first piece of salted meat, but, if her family is any indication, it won’t be her last. Hayley Thomas is working on her debut novel, “Hayley and the Salumi Factory.” She can be reached at htomas@newtimesslo.com.